I really enjoyed this movie. It really makes you think. I will watch again. It moved me deeply. I loved the balance between the important social issues and romance. Thank you Amma! The acting is superb, the story well written and the movie is very thought provoking. 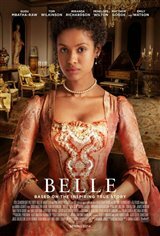 Interesting costume drama based on a true story about a young black girl, the daughter of an aristocrat and his black lover. She is raised in her father's father's house. Interesting effect on slavery laws in England aroung that time. Great movie. It keep me focused throughout. Incredible movie!! I definitely didn't expect to love it as much as I did but it exceeded any and all my preconceived notions. Strongly recommend! !